I just adore gemstone beads when each is so different every one is like a miniature work of Mother Nature's art. These gorgeous purple agate gems definitely fit the bill! I can sit and look through a drawer full of these for hours, LOL! Small matte plum purple glass beads with an aurora borealis finish, and genuine purple agate gemstone beads, dangle suspended from sterling silver filigree at the end of this one-of-a-kind special edition Japanese kanzashi-style hair pin. 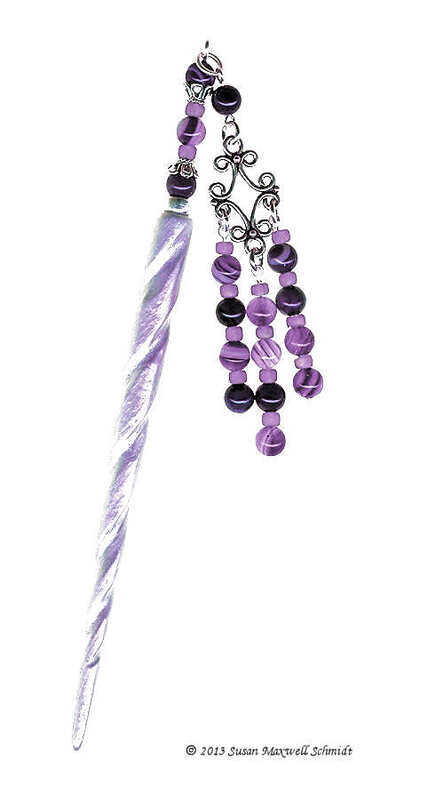 Three genuine purple agate gemstone beads, two of which are nestled into sterling silver filigree bead caps, adorn the hair stick. Matte plum purple aurora borealis glass beads and a sterling silver heishi bead complete the hair ornament design. The hair stick is bone, carved into an elegant twist and hand painted in satiny lavender purple under layers of protective clear enamel. This archived Raisinberry LongLocks GeishaStix hair pin measures approximately 5 7/8" long from end to end (excluding dangle). The dangle measures 3 1/2" in length.